The apartment is centrally located 2 minutes from the beach and the Pine Walk. Close to the main square and local shops, bars and restaurants. There is a balcony on the same floor as the apartment, with a stunning roof terrace with views of the bay and mountains. The apartment comprises 2 bedrooms - 1 with double bed, and 1 twin-bedded - with additional sleeping accommodation on a sofa bed in the living room. The living room opens onto a shaded balcony with a spiral staircase leading to the roof terrace, equipped with comfortable outdoor furniture, built-in barbecue and food preparation and shower areas. Local golf courses are about a 20 minute drive. En-suite bathroom to bedroom 1 with bath/shower over, wc, bidet, wash basin built in to vanity unit. Bathroom 2 with shower, wc and wash basin. Both bathrooms have heated towel rails. Living room with sofa bed (converting to double bed), rocking chair, table and 6 chairs, Satellite TV, music equipment. Hob, cooker, fridge-freezer, coffee machine, toaster. 9 hole course at Golf Pollensa or 18 hole course at Alcanada north of Port d'Alcudia. Outside: French windows in the apartment lead on to a balcony with awning from which a spiral staircase leads to the roof terrace. Barbecue, shower, large selection of outdoor furniture and built-in table and food preparation area + lighting on roof terrace. Utility Room: Washing machine, ironing board and iron, vacuum cleaner plus equipment for barbeque. Cleaning / Towels / Linen / Maid service: Towels and linen included. Additional charge for linen change and maid service mid-stay. Additional hire charge for cot / high chair if required. Very clean and spacious apartment right in the center of the port . Recommend to all . 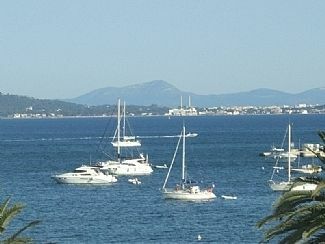 Fantastically located apartment with views of sea and mountains. Spacious and clean. Positives:clean, friendly neighbours, excellent location for town, walking and cycling. Fantastic roof terrace, ideal for catching the last of the evening sun. Not so good: bed very hard and mattress too big for the base. Twice during the stay electricity was cut (no fault of owner), Saturday night kept awake by loud music. Stayed for 3 weeks. Oven and fridge were clean, everything else was either shabby or dirty. Great roof terrace with lovely views of sea and mountains. There was only Spanish tv but after complaining Peter came and updated us to Sky News. The owner promised to connect to a satellite but I honestly think she had no intention of doing this. She said that she didn't think that people watch tv on holiday. I let the owner know my concerns regarding other issues with the apartment and I hope these have been acted upon for future guests. A most pleasant apartment, with a large roof terrace, great for breakfast, yoga, sunbathing and a line (with loads of pegs) to dry our swimming gear. A minor electrical problem was sorted out quickly. The kitchen was well stocked with implements, beds were comfy and the apartment clean. A lovely apartment, well proportioned. Great location for everything. Would definitely stay there again! 2 minutes walk to beach. 15 minutes drive to beaches at Alcudia or Formentor. Snorkeling, sailing, windsurfing, water-ski etc available locally. 5 minutes drive to Pollensa. Easy access by car and bus to other parts of the island. Supermarkets, a wide choice of restaurants and bars all close at hand. Booking Notes: Changeover Day: Preferred changeover day Saturday with departure by 10am and arrival after 3pm but it is always worth inquiring re flexibility. Out of season we can be more flexible about changeover so please ask. Cots and high chairs can be provided for your rental period. Please inquire for pricing. Mid stay linen change and apartment clean is charged at €60 Notes on prices: Prices are for the property per week in UK pounds and include electricity costs, Long lets over winter months negotiable.